04/11/04: Some weeks have passed and here comes another "BPRD happily lost file" in the comics section ! I hope you will like it ! see you soon ! 21/09/04: Here we are, and the site is now over 3500 hits since its creation. Thank you very much for visting this place and I'll trying to keep it up and produce more stuff. I'm not adding it into the gallery for now, but here is a little drawing for this little celebration ! See you soon ! 04/09/04: Hello ! Tonight there are some news on the site ! First, you will find three new black/white drawings in the gallery, including two crossovers with unexpected characters. And then, there is a new "BPRD Happily Lost File" in the comics section. Hope you'll like the new things and feel free to react and comment, and even sign the guestbook ! 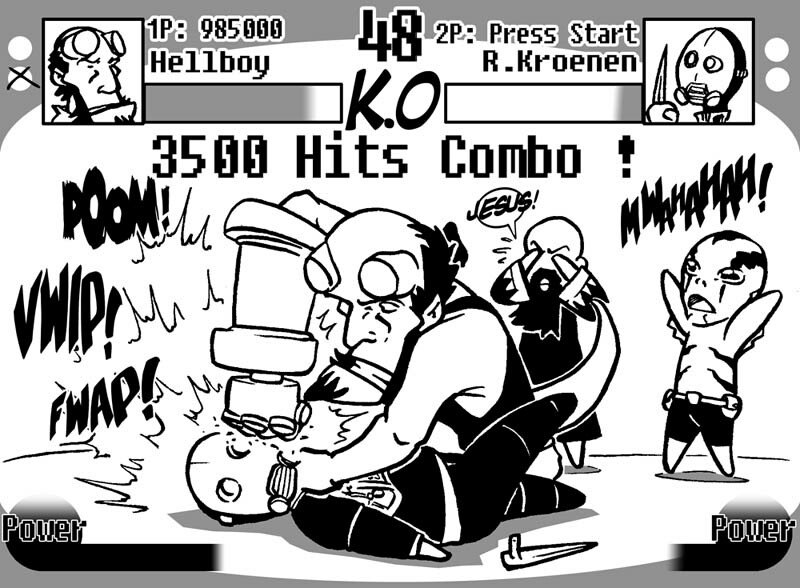 And thank you very much for the comments on the CBR Hellboy forum ! See you ! 24/08/04: After this long month away from keyboard, here comes the "awaited" update ! And here is the grand opening of the "comics" section with two short "stories" starring HB and some of the BPRD crew. I added one b/w drawing and some sketches I used to create the comic pages in the "gallery" section. I wish you a nice reading and hope you'll like them. As usual, your opinion is important, so feel free to comment ! For now I'll try to make more pages, it's really interresting to do ! See you soon ! 24/05/04: Just a little update in the gallery with an new sketch for the opening of the new HB official forum on CBR. I guess more will come but the schedule is quite full... Let's see later ! 15/04/04: Update frenzy ! This time, I just added 6 new b/w fanarts (with various themes, just check....) and 2 new colored ones (one is a collab work with C_C ). Now visit the gallery to see all this ! See you soon ! 10/04/04/: Finally comes an update ! I added today 5 new B/W fanarts in the gallery, and a new colored one. Till now I could not see the movie but I'll try to correct this as soon as possible ! Enjoy the gallery and feel free to tell me what you think about it ! Older news from 2002 and 2003.